2015 January 16: A very difficult session with a NW force 8-9 gale, sub-zero temperatures, and a sky that could not quite make up its mind! Cloud dispersing and re-forming in seconds, with poor transparency and "skylight" due to a mixture of an all-pervading auroral glow together with atmospheric refraction at high altitudes. Under such conditions we were fortunate even to record the tail structure. 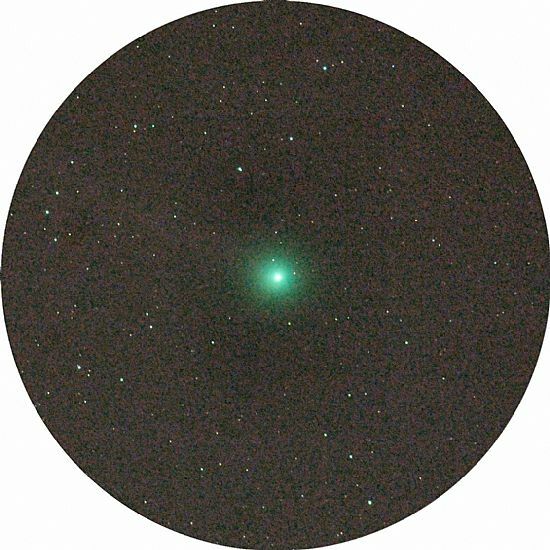 The one thing to our advantage was being able to observe close to the comet's highest altitude at meridian passage. With the short intervals of time available between observing opportunities, it was decided to use the fast 400mm f/2.8 in addition to the 500mm f/.4. 2015 January 16, 19h 06m UT. A 27.7sec. exposure. Nikkor 500mm f/4, D800 SLR ISO 2500. The brightest star in the field (dia. 1.8° approx. ) is TYC 1236-934-1,mag. 7.76 spectral class F0. 2015 January 16, 19h 29m UT. A 17.8 sec. exposure. Nikkor 400mm f/2.8, D300 SLR ISO 2500. The brightest star in the field (dia. 1.8° approx.) is TYC 1236-934-1,mag. 7.76 spectral class F0. The comet's movement against the stellar background may be assessed with reference to the star TYC 1237-704-1,mag: 10.73 seen below, left (close) in the first frame, and below left, more widely separated, in the second frame. Time interval between frames: 23 minutes. 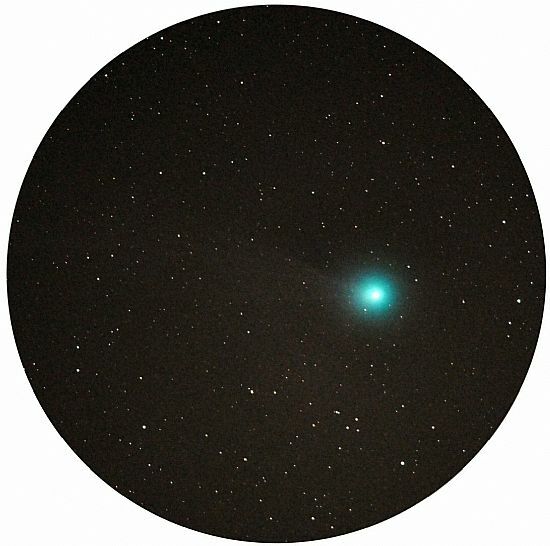 2015 January 15: Most recent observations for Comet C/2014 Q2 Lovejoy. A releatively calm evening of some promise but with poor transparency and variable cloud scatter, forming and dispersing in an irregular fashion making it difficult to secure exposures of more than 30 seconds. Some good results in twilight, but with dark skies came the cloud making it impossible to work beyond 20h UT. However, the first images to show the delicate tail structure were obtained with the 500mm f/4 lens before complete sky cloud cover. 2015 January 12: Observations of Comet C/2014 Q2 Lovejoy. Weather since 7th January has been appalling with severe gales and cloudy skies almost non-stop. The early evening of the 12th showed promise with some good, clear breaks but with a wind gusting to violent storm 11. The 105mm f/1.8 and 200mm f/2 (the latter on an EQ3 mount but only approximately polar oriented since a temporary site had to be used with some shelter from the gale). It proved impossible to use a larger lens due to wind force and cloud, the sky becoming completely overcast from 16h 30m on. The comet becomes circumpolar (never sets below horizon) from the latitude of Orkney on 24th January. 2015 January 12, 17h 26m UT. A 5 sec. exposure (static camera). Nikkor 105mm f/1.8, D100 SLR ISO 1000. The brightest star in the field (8.7° x 12.5°) is omicron Tauri, mag 3.61 spectral class: G8III. The comet would appear to have an integrated magnitude in the region of 3.5 or brighter, making it readily visible to the unaided eye. TYC 658-81-1, mag. 6.68 spectral class K1III. Some drifting and movement due to wind gusts. 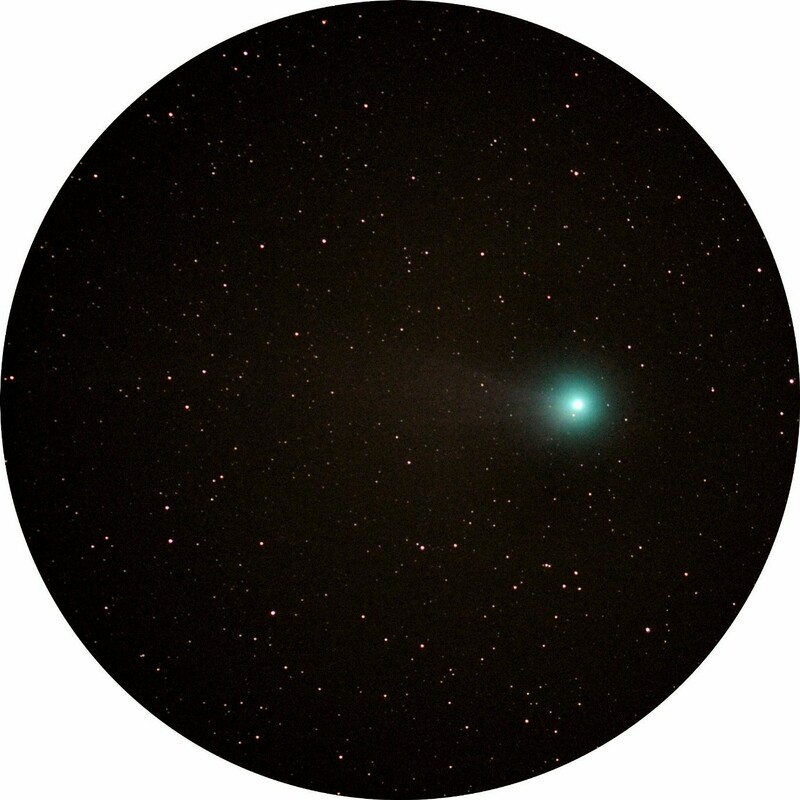 2015 January 07: Observations of Comet C/2014 Q2 Lovejoy. TYC 4726-1376-1 mag. 7.78 Spectral class: K5. 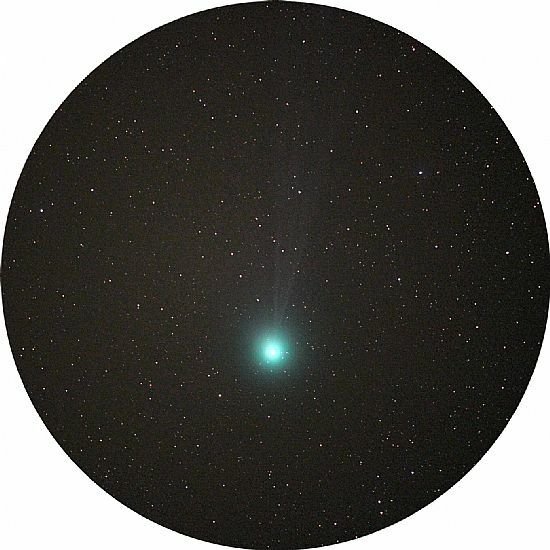 2015 January 06: Observations of Comet C/2014 Q2 Lovejoy. Freakish weather with cloud coming and going on a fresh SWW air flow (force 4-6) giving some clear sky intervals lasting 30 minutes or so. 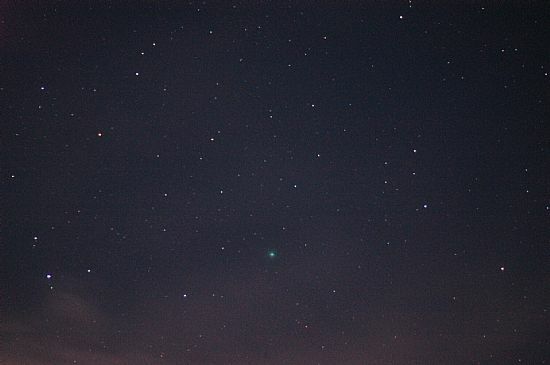 Imaging was possible from the main observing site on Rousay using 500mm f/4 and with 2x converter. 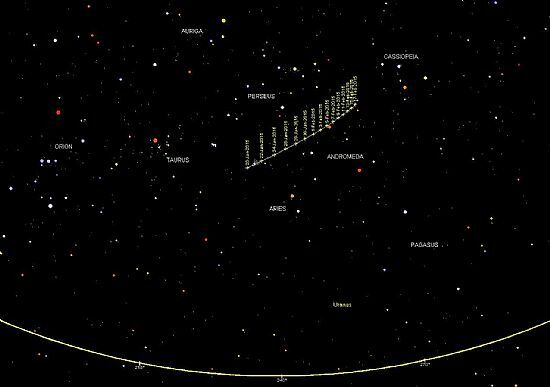 Exposure times were limited to a maximum of 15 seconds by the presence of the Moon (phase 97%) in constellation Cancer. In dark skies, longer exposures would have to take into account the comets rapid angular motion which, at the time of the current observations, amounted to approximately 30 arc-seconds per minute of mean solar time. 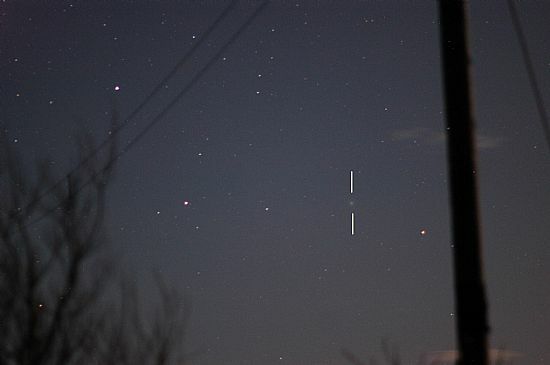 Earlier in the evening an interesting series of images was secured using the fast 105mm f/1.8 on a static tripod mount but with short exposures star drift was negligible, as may be seen from the accompanying sample image. 2015 January 06, 20h 43m UT. A 6 sec. exposure. Nikkor105mm f/1.9 D100 SLR ISO 500. The brightest star in the field (8.7° x 12.5°) is mu Ertdini mag. 4.0. 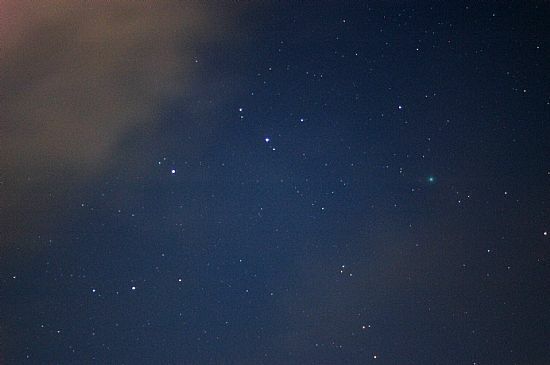 The comet is clearly seen middle right. 2015 January 06, 18h 45m UT. A 10 sec. exposure. Nikkor 500mm f/4 D300 SLR ISO 2000. 2014 December 30: First observations of Comet C/2014 Q2 (Lovejoy) from Rousay. Comet C/2014 Q2 (Lovejoy) imaged 2014 December 30 AT 21 41m UT. Nikkor 105mm f/1.8 D100 SLR, static camera, ISO 500. The comet was in constellation Lepus (shown between marks) low down with an altitude of 8° 29' (declination -21° 27'). 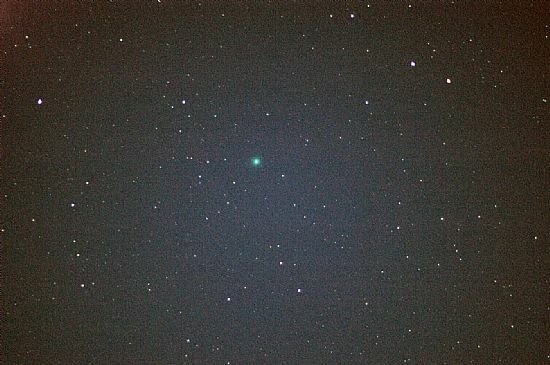 Bright sky background due to Moon (phase 73%, altitude 32° 25' and separated by some 54° from the comet). The brightest star in the field (top-left) is alpha Lep., visual mag. 2.56. 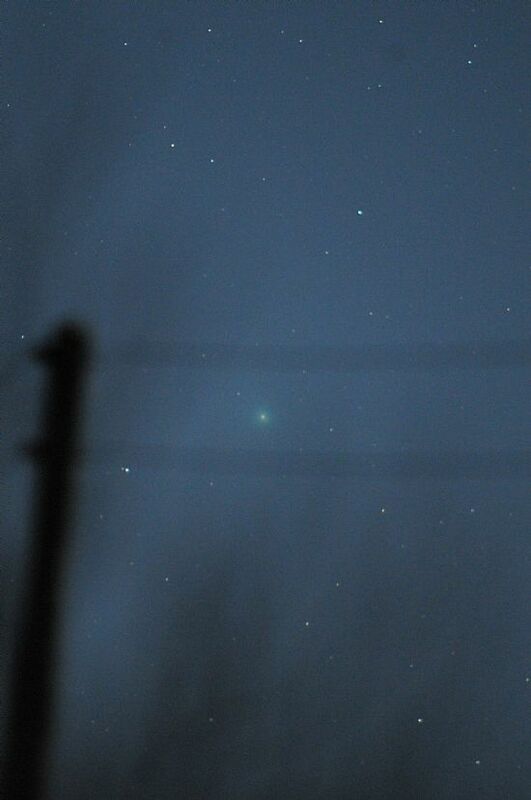 The stars left and right of the comet are: beta Lep 2.82 mag., and epsilon Lep., mag. 3.71 spectral class KIII. 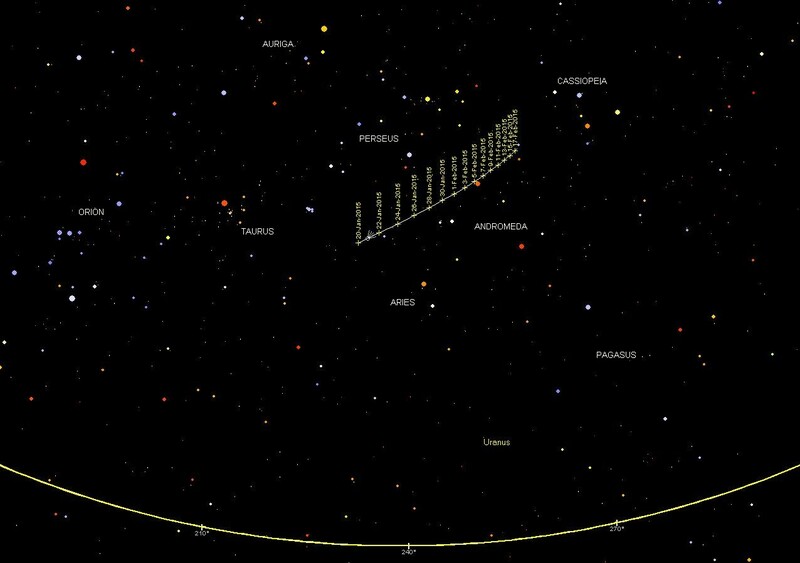 Stars to magnitude 9 are visible here and from a collective comparison the comet’s integrated magnitude was assessed at 5.7. Imaging at the prime observatory site (below) was hampered by vegetation, electricity cables and “hydro” pole! The brightest star in the field (1.7° x 2.6° ), lower left, is TYC 5914-1371-1, visual mag. 7.41: note the star TYC 5914-1061-1 (mag. 9.40) 58" to the left. 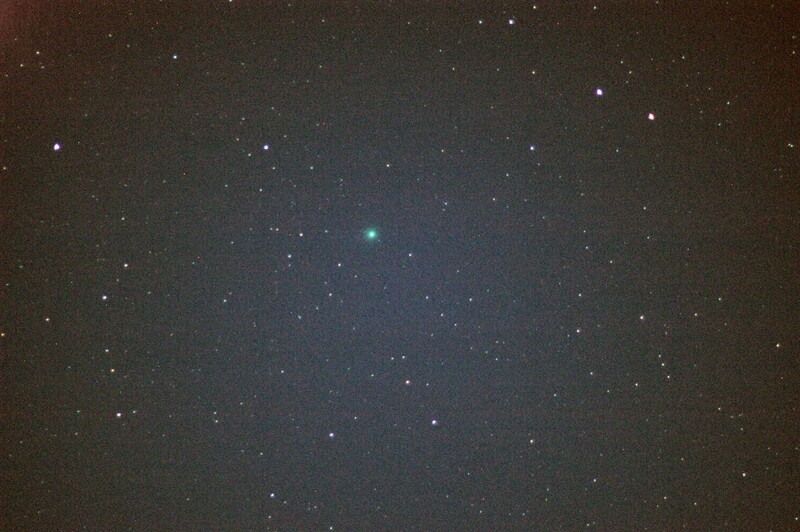 Increasing cloud eventually curtailed work before the comet reached the meridian at 22h 43m UT.